Harmon covered bridge in Indiana County. 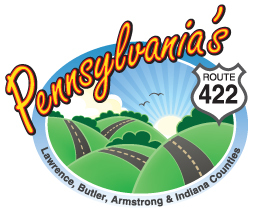 Indiana County offers visitors the opportunity to explore historic sites, cultural events, and ethnic and heritage festivals. For nature lovers, county parks and Yellow Creek State Park offers activities for every season – swimming, fishing, boating and cross-country skiing. Hiking and biking enthusiasts will enjoy more than 64 miles of rails to trails throughout the County. Visitors can recall life at the turn of the century while exploring the beauty of our four covered bridges. Arts and theatre come alive on the campus of Indiana University of Pennsylvania. Famous actor, Jimmy Stewart, was born and raised in Indiana where visitors can experience a little “Hollywood Magic” at the Jimmy Stewart Museum. Known as the Christmas Tree Capital of the World, Indiana County winter events include the “It’s a Wonderful Life” Festival and horse drawn wagon rides to select your perfect Christmas tree. Step back in time with a visit to the Amish community of Smicksburg, where horse-drawn buggies share the road with automobiles and shops sell hand-made goods. Discover Indiana County, just one-hour east of Pittsburgh. Come for Fun, Take Home a Memory!